One of the main aims of this festival is to have women coaches only. 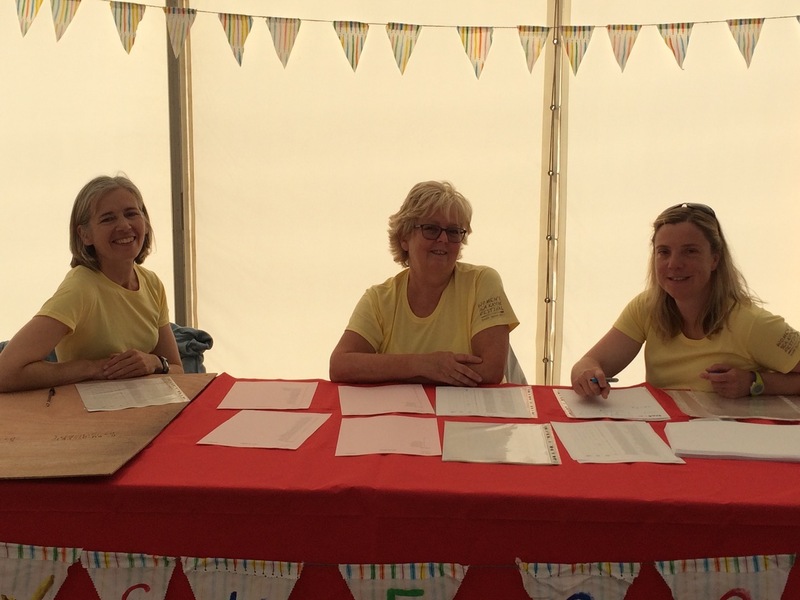 The team at the Festival is pleased to welcome back some coaches as well as introduce new ones. This year again we aimed at diversity and invited some of the best sea kayak coaches from England, Wales, Scotland, and beyond. ANITA DAIMOND Anita has over 20 years of experience of working with people in outdoor environments promoting connection with nature, landscape and heritage. She combines her passion for sea kayaking and the environment to provide trips that maximise enjoyment of the surroundings. 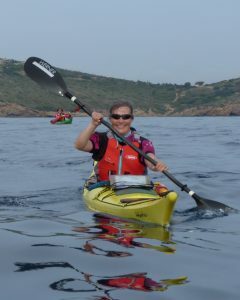 She has been kayaking for 17 years, is an Advanced Sea Kayak Leader and Moderate Water Sea Kayak coach. 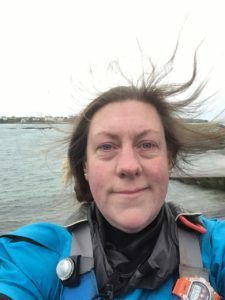 In 2018 she established Sea Môr Kayaking based from her home in North Waleswww.seamorkayaking.wales. 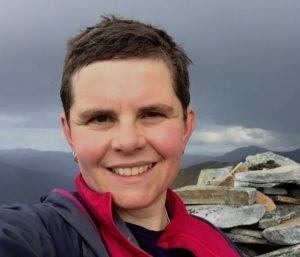 She regularly kayaks in the tidal seas around Anglesey and the Llŷn Peninsula but has also undertaken expeditions in Scotland, Norway, Iceland and Sweden. Anita is especially delighted to be joining the event in Devon this year as she recently discovered that ‘Daimond’ means ‘man of Devon’. ANNA MORENO Anna started kayaking on 2003 and fascinated by the sport, became hooked very soon by the contact with nature and the options of playing, expeditioning and knowing areas from a different perspective. 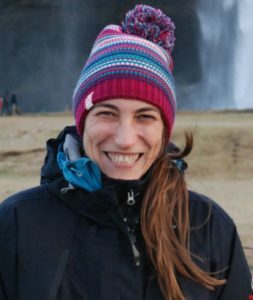 She loves paddling close tomhome, in the Costa Brava, as well as finding the excuse to travel and discover new places and meet and learn from kayakers from all around the world. You may easily find her anywhere with a bit of coastline, traveling with her van and her kayak on top. Some of her favourites destinations are Britany in France, Wales, Greenland and the Scandinavian countries. Anna loves coaching and spreading her enthusiasm for sea kayaking. One of her favourite moments is that smile after a first roll or a manoeuvre that seemed impossible before. She started teaching in her local club “Pagaia” in Catalunya, and became a certified coach by Spanish federation and Coach Level 2 by British Canoeing, she is also a certified Advanced Sea Kayak Leader (former 5* award). 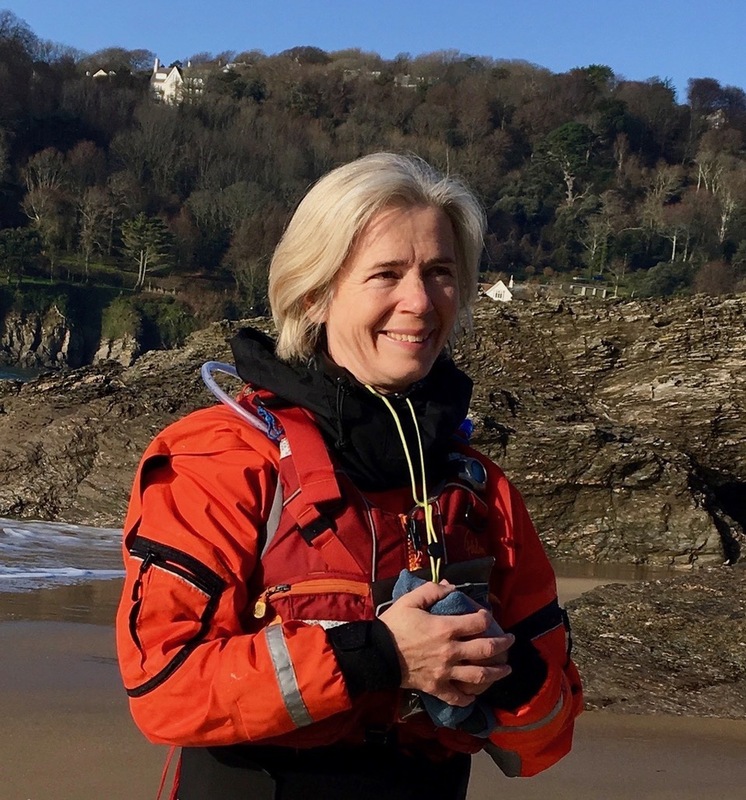 She’s had the opportunity to coach in different events in Catalunya, Spain, UK, France, Estonia, Italy, Norway and Denmark, and is very excited to be again part of the Women’s Sea Kayak Festival in South Devon. EILA WILKINSON Eila works as an international sea kayak coach based in Holyhead, Anglesey where she co-runs Tidal Waters @ Sea Kayaking UK with Nigel Dennis. Tidal Waters specialities in performance sea kayak coaching in the tidal waters of Anglesey and annual expeditions to the Outer Hebrides, Orkenys, Ireland etc. Eila is UKCC L3 AWE coach, SKL & CNTP provider and aspirant ASKL & OWNTP provider. 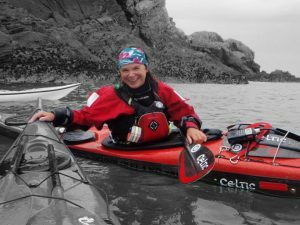 She has paddled around Anglesey a few times and has completed a circumnavigation of Ireland & various firsts in the Bahamas. She coaches at various locations around the world and is getting quite a demand for female specific coaching both at home and in the USA. She is supported by SKUK, Celtic paddles, Reed Chillcheater, Typhoon & Snapdragon. 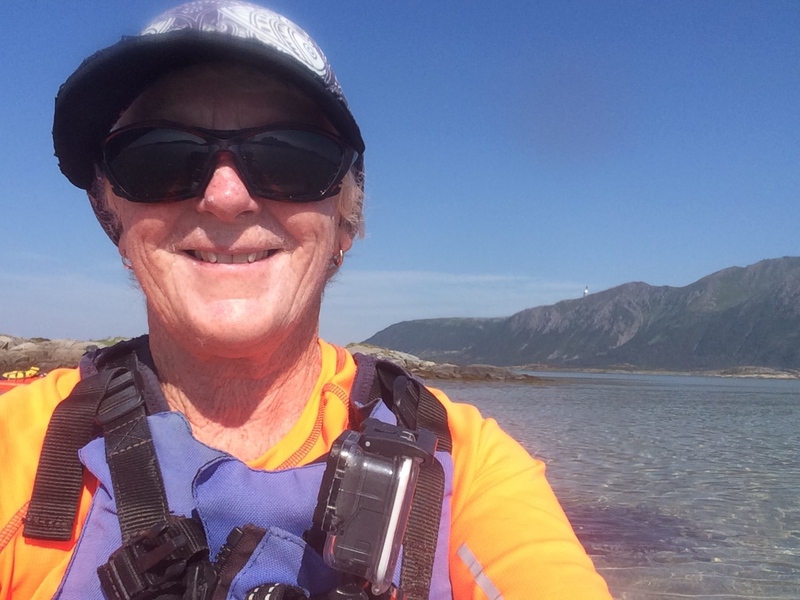 NICKI MANSELL I have been sea kayaking for over 40 years and still enjoy nothing more than packing up my kayak and heading out into the wilds with a tent and camping out on remote beaches with better views than any hotel. I have been a coach for over 35 years and was a geography teacher until two years ago. I am now retired but my love of kayaking links with my love of landscapes and my favourite sort of guiding is to take people out into new environments and try to interpret how the landscape has been formed and the factors now affecting them. I love maps and charts and will spend hours looking at routes and possible trips. I have paddled in Greenland, Baja, Norway, USA, Canada, Belize, Mauritius and many places in the Mediterranean but still love to go out in Jersey’s coastal waters where the weather, tides and season mean that the coast is always changing. I was at the first WSKS and loved the whole event from the yoga in the mornings to the superb food and of course the paddling and good company. Even the weather and mud did not dampen my enthusiasm and I am really looking forward to coming back and paddling the great Devon coastline again. 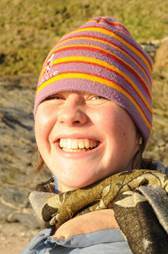 RACHEL KEHOE For me, greenland rolling is a great joy in itself, both as a relaxation as well as a challenge. However, I also love that it enables me to play in dynamic water conditions, safe in the knowledge that I will be able to come up again! It will be great to work with you at the festival, and I’m looking forward to introducing you to the techniques to develop a roll of your own! SUE COULING I have been paddling for over thirty years in most types of boats and have had lots of adventures exploring many parts of the world by boat. 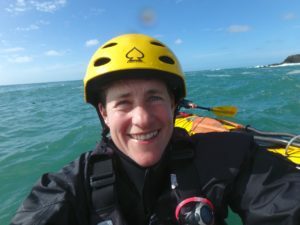 More recently I have developed my passion for sea kayaking and I am now an Advanced Water Sea Leader and Performance Coach. 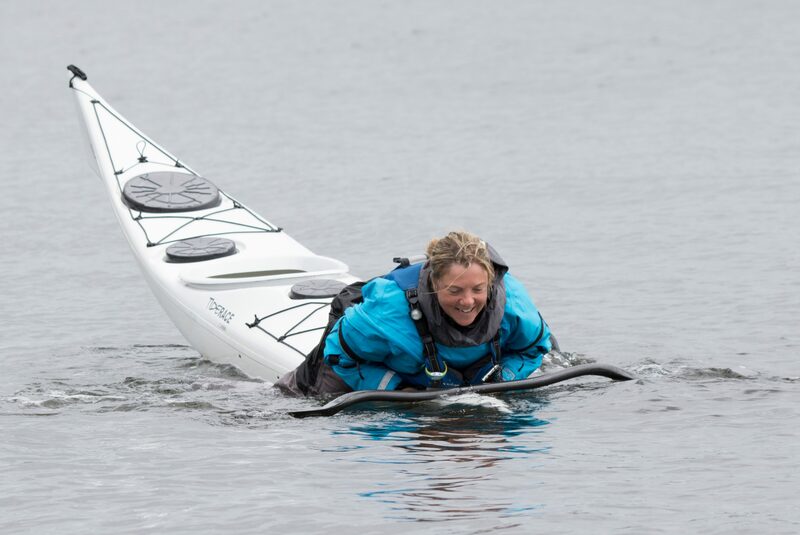 I have worked on a number of women only sea kayak events and enjoy the atmosphere and dynamics of these events. I particularly like helping people to develop their confidence in the sea environment. NATALIE MADEROVA Natalie works as a teacher and has kayaking as one of her hobbies, although she spends more time in the boat than doing anything else. Natalie lives in London and considers The Tideway to be one of the most exciting paddling environments in Britain, she would know as she circumnavigated Britain in 2012. Apart from journeys and long crossings Natalie enjoys most coaching others. She is a UKCC L3 coach with Moderate Water Endorsement, and Advance Water Leader. Together with her husband Michal they set up Mad Coaching Project (Make a Difference), through which they raised £6000 for different charities. 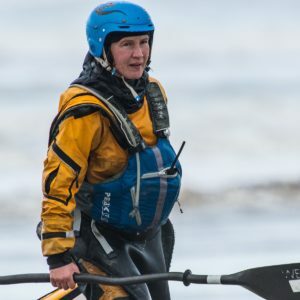 JULIE PERREN Julie discovered sea kayaking after moving to Devon 13 years ago. She enjoys the freedom to explore the coastline of the many diverse coasts that the UK has to offer. Further afield she has enjoyed exploring Jersey, France, Norway and Western Greenland always with a sketchbook to hand to record the journey. 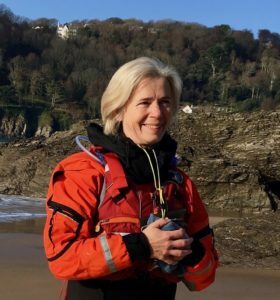 Back at home in South Devon she has just become the Chair of Totnes Canoe Club, based on the River Dart where sea kayaking, once barely existent in the club, is catching up with traditional white water paddling amongst the 200 members. 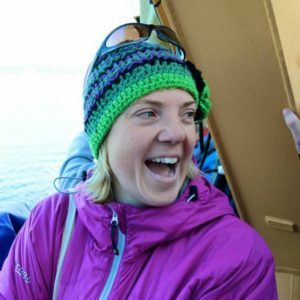 She can often be found on the sea leading groups and coaching but also enjoys white water kayaking, canoeing and has recently discovered surf skiing. Julie is a Level 2 coach, BC Sea Kayak Leader (old BC 4*) with BC Moderate Water Endorsement. ANN MERRYWEATHER Ann is a Sea Leader and a level 2 coach from Norfolk. She recently gave up her proper job and is trying to decide what she wants to do when she’s grown up. She mostly paddles the sleepy rivers of Norfolk, but regularly makes UK excursions, usually to the West coast of Scotland, but also other destinations from the Scillies to Shetland! She has been lucky enough to paddle in Lanzarote, Norway, Sardinia, Greece, Turkey, New Zealand and Canada. The destination wish list grows almost daily! Ann is almost as likely to be found on top of her kayak as in it, and enjoys using balancing challenges as part of her coaching. She is particularly excited to be returning to this festival for the third time, but for the first time as a coach. KATIE ELLIS Katie started kayaking when she was about 11 and then got a job in Mylor where she used to kayak to work. 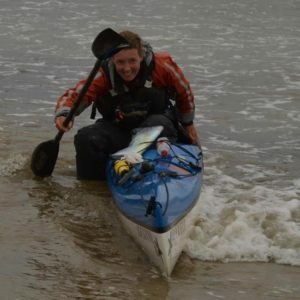 Katie got into WWR at university and then sea kayaking when she was in Cornwall as there is a fantastic coastline to explore. Katie is a member of Falmouth canoe club and regularly paddles with them. In 2015 Katie circumnavigated mainland Britain with Lee Taylor which was a great experience that really improved her handling and navigation skills.